Description : As per Type 20, coat of arms and BHOPAL in double frame oval covered with design and persian inscription, but inscribed "H.H. 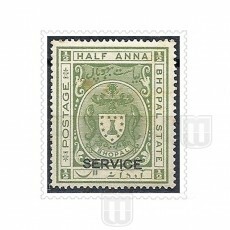 BEGUM'S SERVICE" at left, "BHOPAL STATE" at right, top "HALF ANNA", down denomination in persian, 1/2 in square in four corners. Description : As per Type 20, coat of arms and BHOPAL in double frame oval covered with design and persian inscription, but inscribed "H.H. 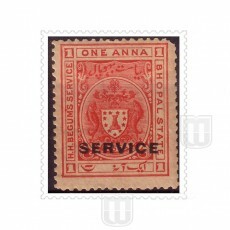 BEGUM'S SERVICE" at left, "BHOPAL STATE" at right, top "ONE ANNA", down denomination in persian, "1" in square in four corners. Description : As per Type 20, coat of arms and BHOPAL in double frame oval covered with design and persian inscription, but inscribed "H.H. BEGUM'S SERVICE" at left, "BHOPAL STATE" at right, top "HALF ANNA", down denomination in persian, "1" in square in four corners. Description : As per Type 20, coat of arms and BHOPAL in double frame oval covered with design and persian inscription, but inscribed "H.H. 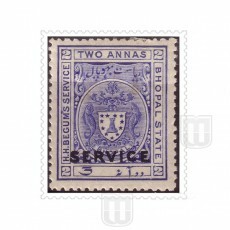 BEGUM'S SERVICE" at left, "BHOPAL STATE" at right, top "TWO ANNAS", down denomination in persian, "2" in square in four corners. Description : As per Type 20, coat of arms and BHOPAL in double frame oval covered with design and persian inscription, but inscribed "H.H. 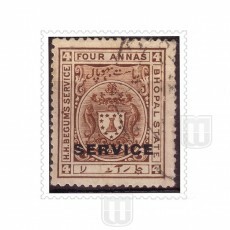 BEGUM'S SERVICE" at left, "BHOPAL STATE" at right, top "FOUR ANNAS", down denomination in persian, "4" in square in four corners. Description : As per Type 20, coat of arms and BHOPAL in double frame oval covered with design and persian inscription, but inscribed "H.H. 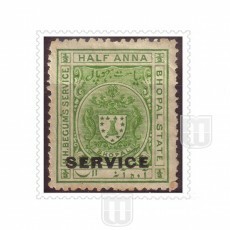 BEGUM'S SERVICE" at left, "BHOPAL STATE" at right, top "HALF ANNA", down denomination in persian, "1/2" in square in four corners. 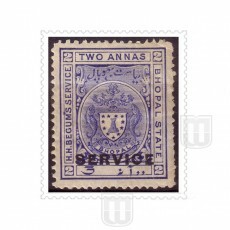 Description : Coat of arms and BHOPAL in double frame oval covered with design and persian inscription, inscribed "POSTAGE" at left, "BHOPAL STATE" at right, top "HALF ANNA", down denomination in persian, "1/2" in square in four corners. 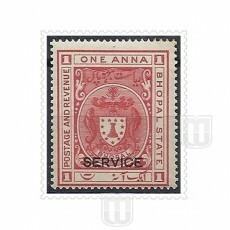 Description : Coat of arms and BHOPAL in double frame oval covered with design and persian inscription, inscribed "POSTAGE AND REVENUE" at left, "BHOPAL STATE" at right, top "ONE ANNA", down denomination in persian, "1" in square in four corners. 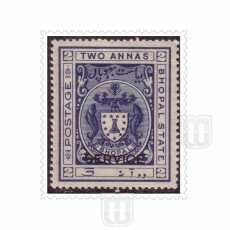 Description : Coat of arms and BHOPAL in double frame oval covered with design and persian inscription, inscribed "POSTAGE" at left, "BHOPAL STATE" at right, top "TWO ANNAS", down denomination in persian, "2" in square in four corners.